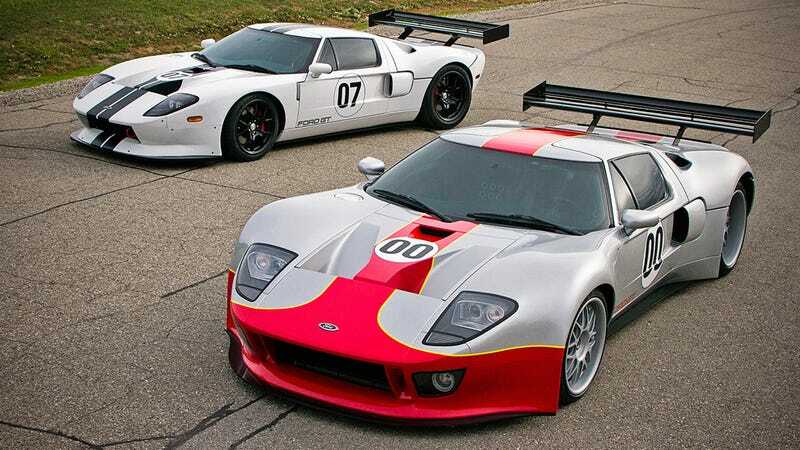 We were big fans of the GT1 Matech Ford GT racecar. Now you can have one for the road. Excuse us while we drool. No more Ford GTs in Le Mans? Technically, this isn't a road-legal racecar, so much as a street car upgraded to near-racing specifications. It is the work of RH Motorsports, who bought the original Matech 2009 GT1 prototype race car, all of the molds, and the Matech GT3 race car's complete bodywork. Now RH Motorsports is planning on building 20 of these street-legal race replicas called the GT1-S. The GT1-S comes with race-derived suspension, a 4" widened track, the new bodywork, and a tuned engine. You can order a 600 horsepower naturally aspirated motor, a 760 horsepower supercharged one, or a 1,000 horsepower twin turbo set up. They'll also have a milder GT3-S.
We'll keep dreaming so long as we don't hurt our heads thinking about how weird it is to turn a race car (the original Ford GT40) into a street car (the Ford GT) into a race car (the GT1 Matech Ford GT) into a street car (this GT1-S).